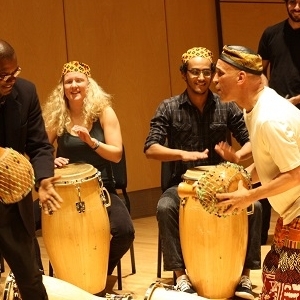 The sounds of Afro-Latin drumming will fill the Auditorium in Wieden Hall when the University of Maine at Presque Isle presents Michael Wingfield on Monday, April 11 at 7 p.m. Admission is free but donations for future cultural arts programming will be accepted at the door. Michael Wingfield is a performer and educator with more than 25 years of experience in the African-Caribbean percussion arts and culture. Through instruments such as conga drums, bata, shekere, flute, and voice, he interactively imparts the spirit and history of the African Diaspora in ways that speak to today’s issues of diversity. Wingfield’s forays into the rhythm and songs of African New World music have brought him onstage with performers such as Flora Purim & Airto, Sun Ra, and Herman Johnson. Cameo appearances include the Portland Symphony Orchestra, Richie Havens and Reynaldo Gonzalez. Wingfield will spend a busy three days in northern Maine, from April 10-12. On the first day of his visit, he will present a Community Workshop on African drumming open to all interested participants on Sunday, April 10, from 2-4 p.m. at the Unitarian Universalist Church of Houlton. Cost is $20 per person. His performance at UMPI on April 11 promises to be an interactive one. Wingfield is known for engaging the audience in occasional call and response and encouraging people to dance in the aisles to the rhythms, if they feel moved to do so. The following day, he will be hosting a workshop for students on the UMPI campus. To be held in the UMPI Campus Center’s Owl’s Nest from 6:30-8:30 p.m. on Tuesday, April 12, he will work with students from Carol Ayoob’s Experience of the Arts class, and other interested students. Students should contact Ayoob at carol.ayoob@maine.edu for details on participating. Through the rhythm and song of the African New World, Michael Wingfield works in settings spanning pre-school to college, health care facilities, libraries, festivals and music halls alike. 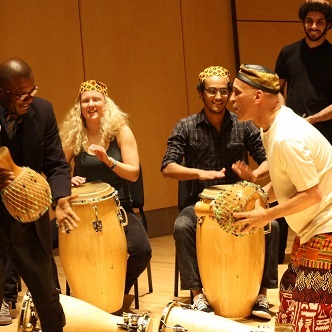 Currently teaching Afro-Latin Music ensemble at Bowdoin College as a guest lecturer, his residencies augment music, social studies, literature programs, and team-building curricula. For more information about the April 11 performance at UMPI, contact Gayla Shaw at 768-9452 or umpi@maine.edu.